In the Ravelry group, we have been working on Colour Studies. 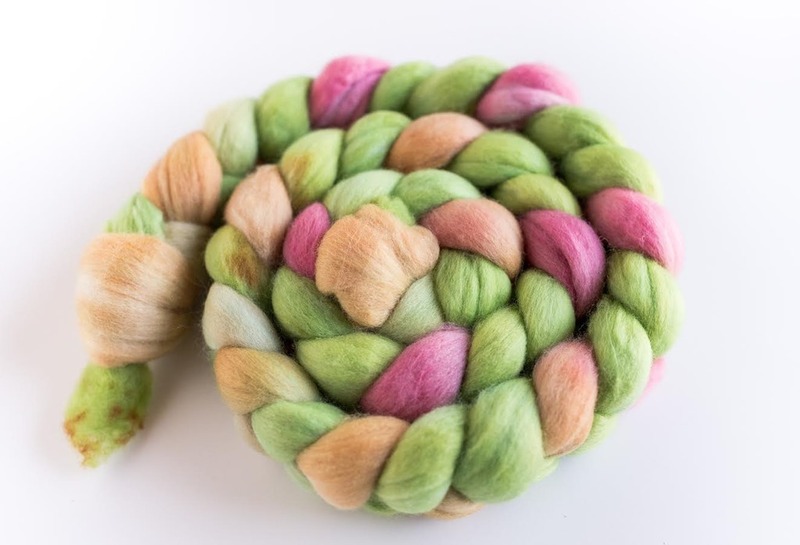 We had two colours to play with and I decided to use my first braid (pictured above) to spin up a bunch of different samples. 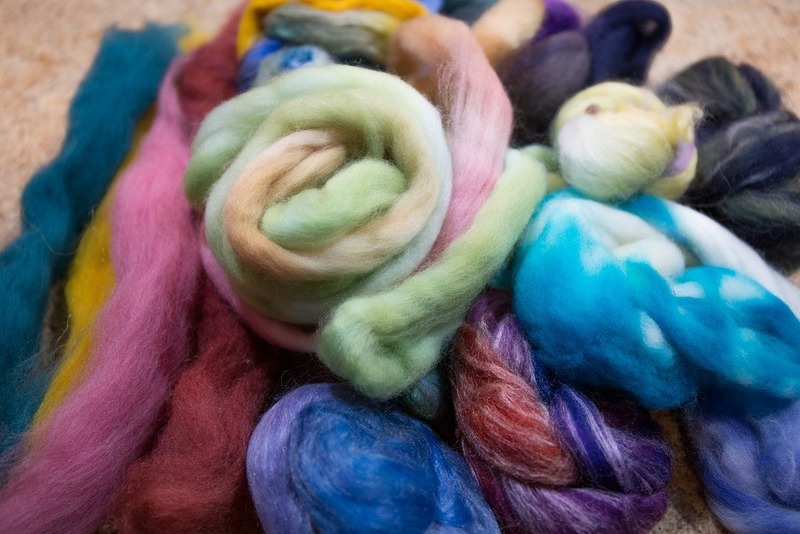 My intention was to explore how colour could be spun in a variety of different ways. 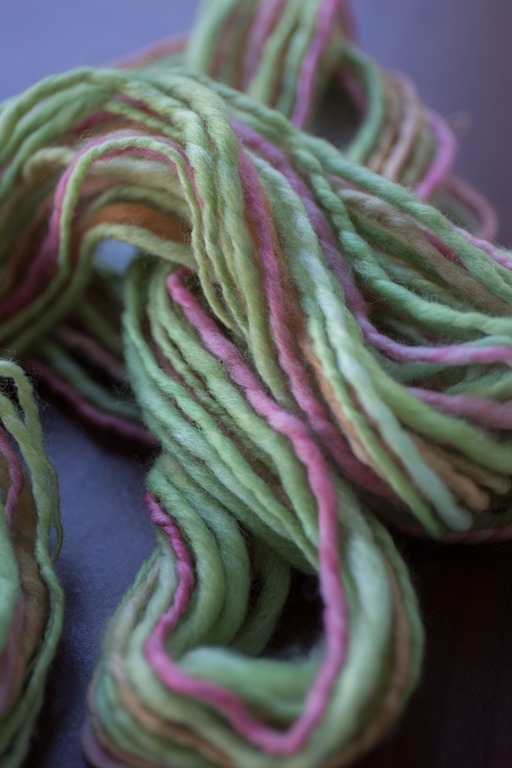 As well, I wanted to examine my own process for spinning colour and I learned quite a few things about both myself and colour on fibre! To begin, one of the first things I do when I am looking at a braid of fibre is turn the photo into black and white to determine the tones in the fibre. This helps me decide if I want to highlight or hide the darker and lighter tones. To hide them, I can card the colours of the braid together on my drumcarder or blend them on my combs. To highlight them, I have chain ply or intentionally ply the colours together to keep darks with darks and lights with lights. These are just a couple of ideas but there are many more to try out! For this colourway, the overall tone of the braid was similar so I didn’t have to worry about darks or lights. 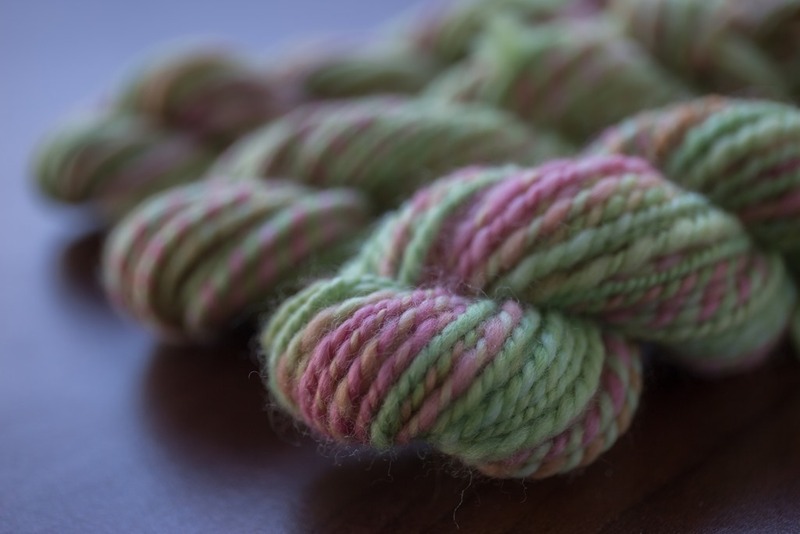 The pink was slightly darker in tone but basically, whatever I chose to do, the yarn would be a medium tone. 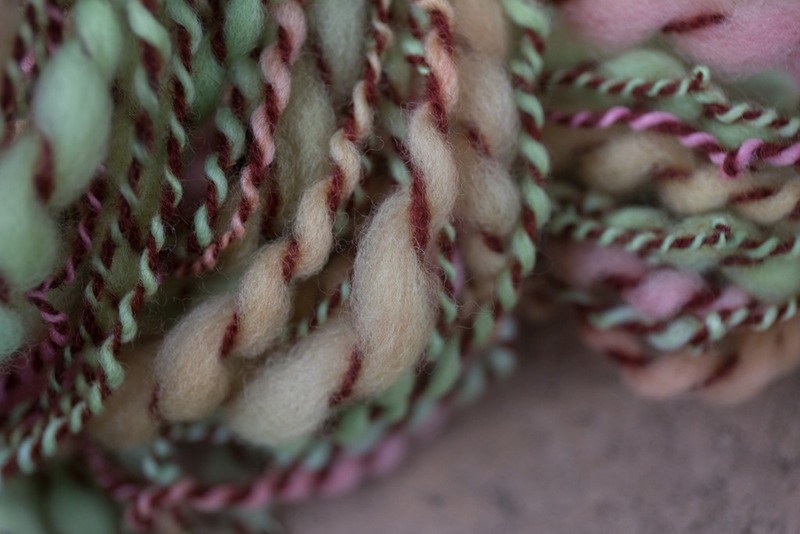 I look for braids of fibre like this when I want a muted colourway to spin that will highlight stitch patterns. It is very easy to loose the stitch pattern in really dramatic, tonal yarns – they are really fun to spin but finding a pattern can sometimes be a challenge. Next, I had to decide how to spin it! I decided to start with a traditional 2-ply yarn and a centre-pull ball 2-ply yarn. I love centre-pull balls because it minimizes how many bobbins I need to find, my Lazy Kate can stay put away and I only need my niddy-noddy to wind off at the end. The difficulty with centre-pull balls is that the colours are literally being folded back on themselves so it can cause a lot of barber poling. If this is intentional, that is great! Sometimes, though, I want to minimize this effect. 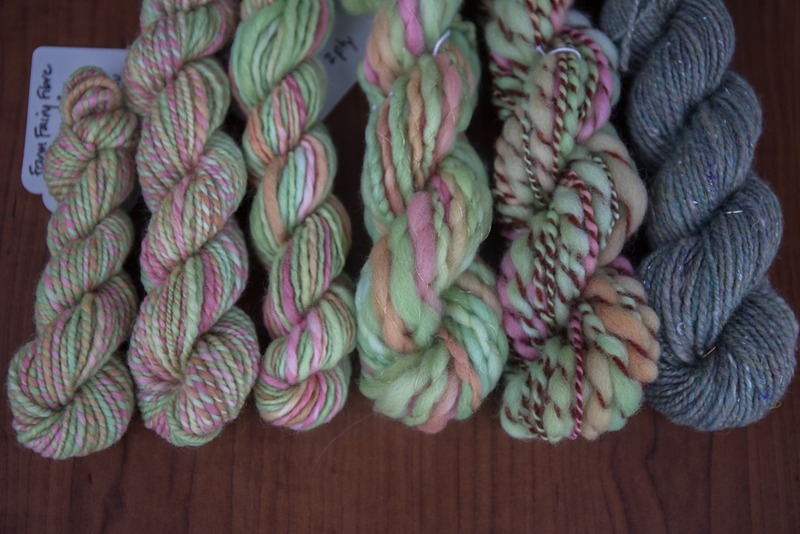 At this point, I decided to spin some singles yarn. I had contemplated a chain ply but in the end, I was happy just to make a singles yarn to compare the preservation of colour in this braid compared to the 2-ply yarns made thus far. 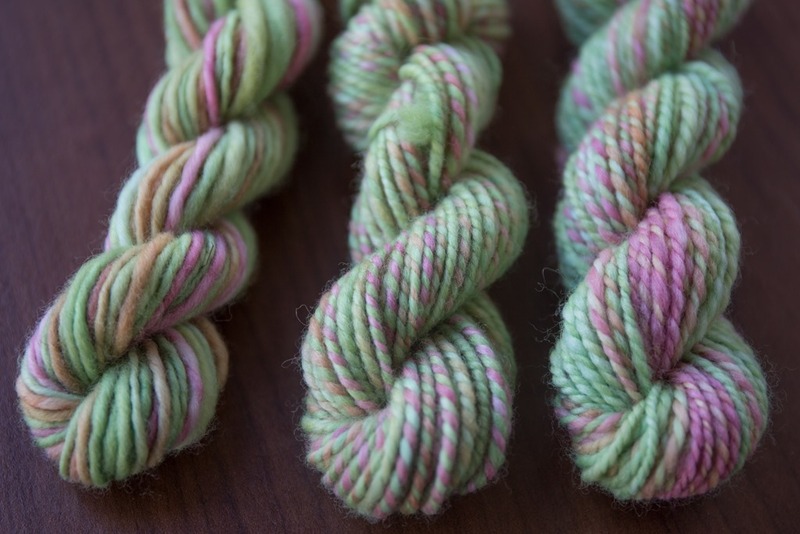 Each of these yarns had the same original stretch of colour along them – I had stripped three lengths off the braid vertically so the green of the centre-pull yarn was interesting to me. 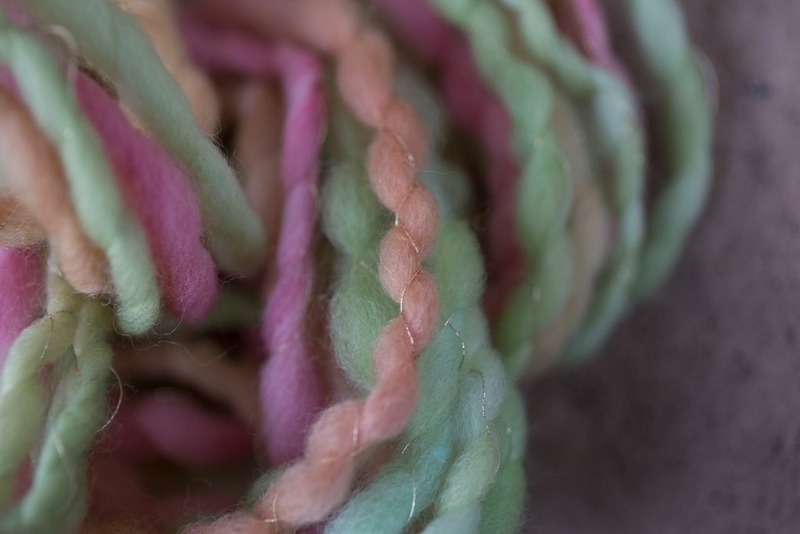 I used a combination of my scrap fibre that I use for carding, as well as adding thread, sari silk and sparkle. 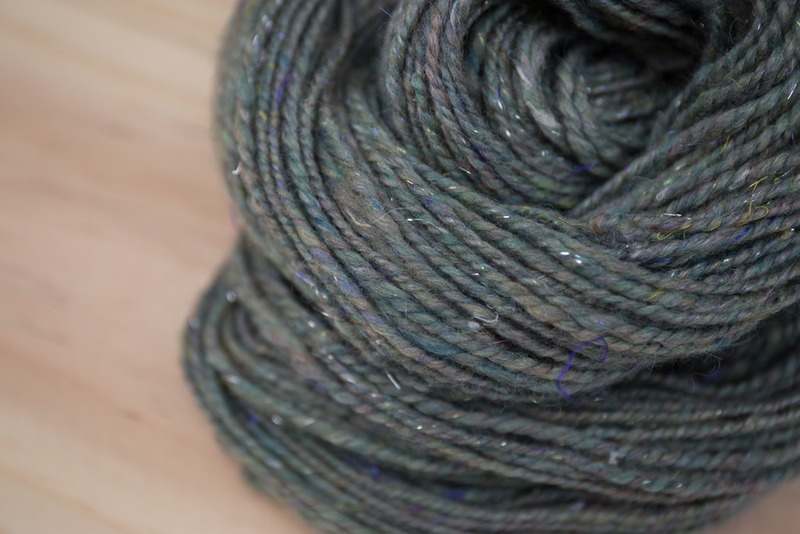 Below is all of the fibre I added to the original colourway, which is laying on top! It is simple and elegant! 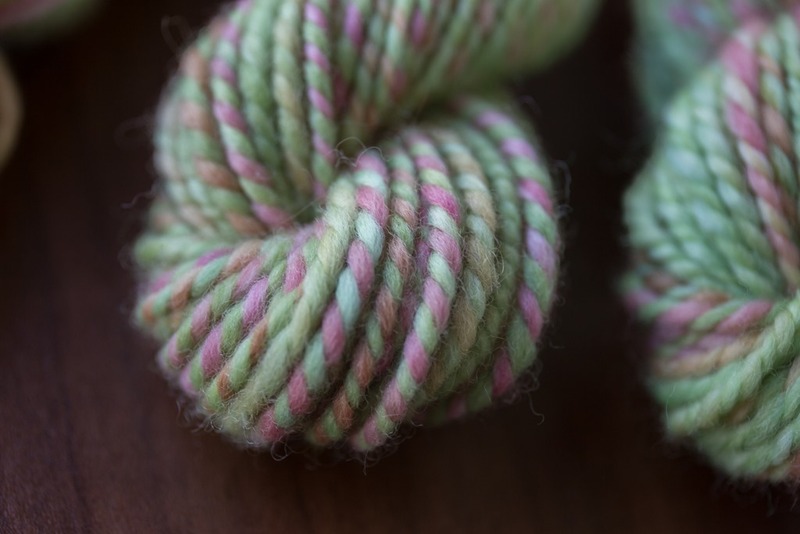 Crepe yarns are really interesting and create an interesting effect – spiral plied in one direction, they are then cabled back the other direction. The opposing twist creates a beautiful rick-rack effect. I certainly hadn’t ‘wrecked’ the colourway with either of these two experiments so I decided to make a flame yarn (thick n thin singles spiral plied with a commercial yarn or thread). Oh goodness. I hate this yarn. I know some out there will like it but it is just not my cuppa! The high contrast of the rust-red was too much. The complement of the red and green creates mud, which just isn’t visually pleasing to me. So, yes, you can wreck colourways if you try hard enough! In the end, I am really happy with this study – I learned a lot and tried some new-to-me yarns. I also learned where my outer limits on colour lie – I don’t like those barber poles that are really high contrast, particularly in complements of each other (red and green). For this split complement study, I think my results were really interesting – the green definitely took over at every chance it had but the camel and pink were there to balance it out. That said, there was significantly more green in the braid and that helped keep it sedate. This would be a nice colourway for pattern work because it wouldn’t be lost in the colour of the finished yarn. Overall, I’d say this study was a success! I’m still working on my Sunset colourway and I will be posting on that soon! Have you participated in Colour Studies this time round? How were your experiments? 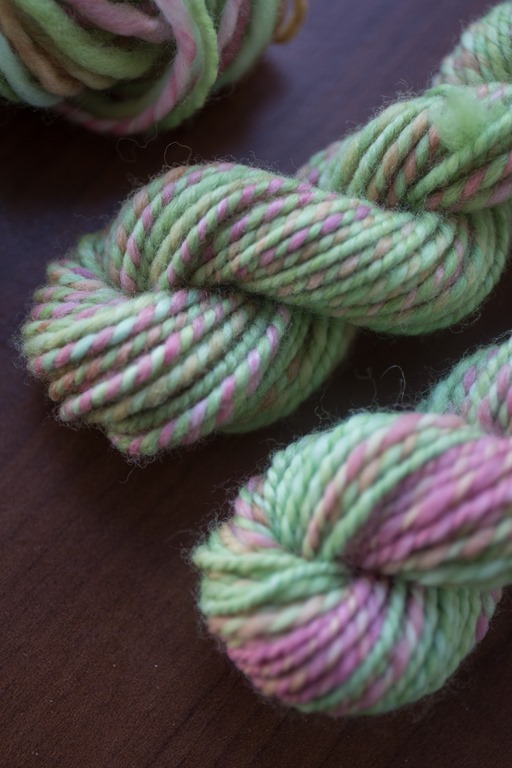 Please leave a note below or share and use the #woolnspinning so we can see what you’re working on! This is such a valuable post Rachel. Thank you for sharing your experiments with such beautiful photography. I am most interested in the difference between the traditional 2 ply and centrepull ball. I am presuming this difference is because of the braid format but I wonder if that made a difference when I plyed off the first batt of my Cheviot. As the best studies say, further research is required.